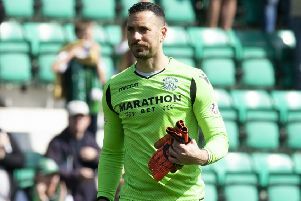 Neil Lennon believes Hibs fans have yet to see the best of Martin Boyle, imploring the 23-year-old to show a bit more belief in his ability. Lennon has shown great faith in the former Montrose and Dundee player, choosing him ahead of Jason Cummings as the top scorer’s form dipped earlier in the season and being rewarded with a string of important goals. While most think of Boyle as an out-and-out winger with blistering pace, Lennon has deployed him through the middle but played him wide left against Championship title rivals Dundee United with new signing Chris Humphrey on the opposite flank. And he was left delighted to see the pair terrorise the Arabs’ full-backs. Lennon described his performance in the 3-0 victory which pushed Hibs four points clear at the top of the table as “brilliant”, but feels there’s plenty more to come from a player who is enjoying his best season in front of goal for the Capital club with six so far. He said: “I know I have a very good player in Martin Boyle, he just needs to believe in himself a little bit more. I just like what he has, he is direct, fit and always a threat. “He’s got so much to his game. He has pace and technically he is very good. His movement is good and he’s got goals in him, He’s certainly had a good season, he has made a huge contribution. He’s intelligent and his movement off the ball is very good. “I thought he had a great game against United but even then, at times, he got into great positions and just lets that second touch go away from him. While Boyle’s name has been one of the first on Lennon’s team sheet in recent weeks, the manager admitted he’s likely to make a late decision on his starting line-up against Dumbarton today to take into account conditions at the Cheaper Insurance Direct Stadium, revealing he has a few players carrying “some bumps and bruises” while striker Brian Graham has been suffering from flu this week. Although Scotland midfielder John McGinn made a surprise appearance against United following ankle surgery, stepping off the bench to claim Hibs’ third goal, Lennon revealed he’ll have to think hard about what part the 22-year-old may play this afternoon.